With Kingdom Age I haven't really ran into this mechanic. There are two bars that refill on a basis of about two and a half minutes. However, I could build an Alchemy Lab which will generate energy for my character to go out on missions. Next to the Energy bar sits the Stamina bar which refills separately from the Energy bar and this one pertains to the army being raised for the kingdom. One for the character and one for the entire army. The cool thing about this is that once I level my character up I get both bars completely refilled. So I have found several ways to prevent myself from running out of the needed fuel in the game to keep going. Outside of dispatching the typical “social” game issues Kingdom Age handles like a Diablo style game on the character missions and like Suikoden with the army attacks. Each thing builds up experience points that leads to leveling up and cashing in level points to strengthen the character and/or the army under the player's command. 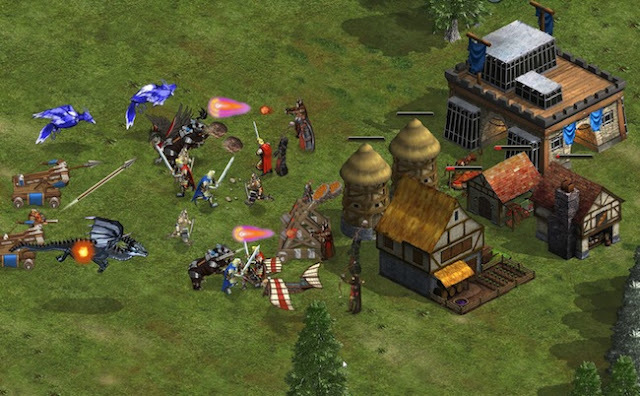 With the army battles you take on other players in the Kingdom Age world. Troops will die, gold can be lost and the battle could end with a debt. While I can attack other peoples kingdoms I have to make sure I'm keeping my place protected, because I can also be attacked. Develop your army how you want. If you have friends that also play Kingdom Age you can build an alliance which can be used to help you find items that you don't have access to yourself. You can ask your friends to send you materials to build special buildings and to research weapons/armor and such are needing; forming an alliance necessary if you're wanting to have an expansive kingdom. So while you can play solo this game encourages players to team up and help each other out. 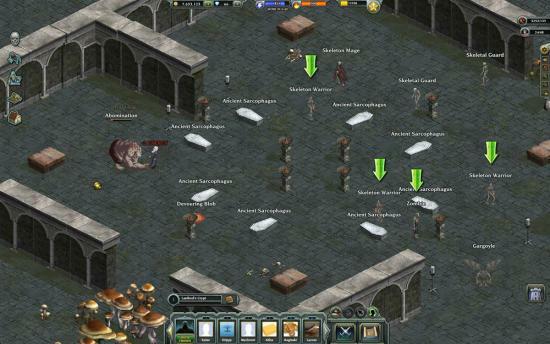 The enemies with the green arrows are mission targets...they must die. Right now Google Plus is still growing and trying to make inroads into Facebook's social market; I know that, but games like Kingdom Age has some really cool features that need someone that has several friends playing to actually enjoy. Such as asking friends for materials that you don't have access to yourself. These materials are needed for completing certain buildings, training newer types of soldiers, expanding the territory of the kingdom. So while Funzio was able to remove most of what hampers social games on a site like Facebook...there are still issues that haven't been addressed. I'm not adverse to making friends, but I just don't like or care for making "friends" through a social site just to be able to keep playing in a certain direction. There needs to be a separate “hey if you have friends playing this game as well, invite them to join your kingdom and attack other players who also have multiple friends playing” feature. While it wouldn't necessarily be a bullet point on the back of a games case or in the special features of the online portion of the game. I believe it should be separate from playing the game itself. 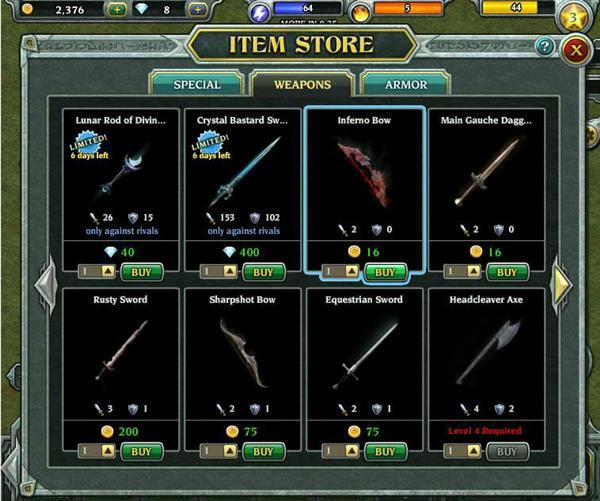 There is an in-game store where the player can buy weapons, armor and items for missions that involve quests for the character I have created. A great aspect to Kingdom Age is that all I have to do is buy the item once and it will translate to a purchase for my army. 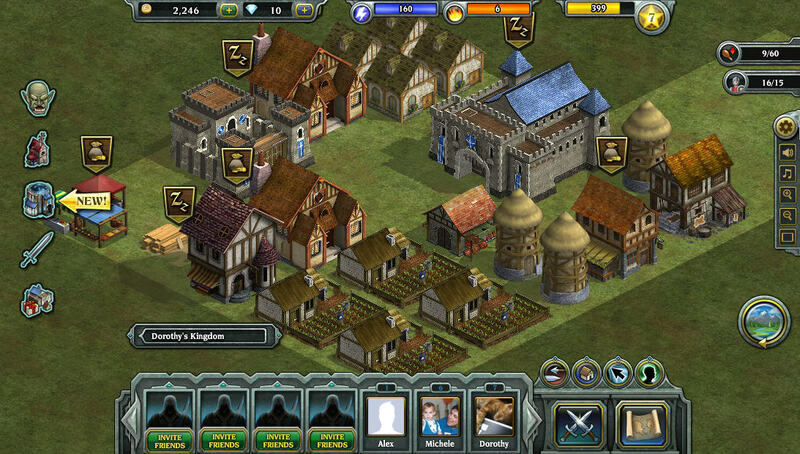 So one purchase of any item store product will equip to my troops that attack other player's kingdoms. So there are several layers of overlap within the game. Attacking enemies on the field takes a certain amount of energy. The more difficult the enemy is the more energy must be spent to kill it. Each attack grants experience points and when an enemy dies in battle they drop various items according to the type of being they were. Everyone will drop experience and gold, but the items could range from weapons to armor and even special items that can be stored in for boosting the troops sent after other unknowing kingdoms. I've greatly enjoyed playing this game when I've had time to dive into my kingdom's daily operations concerns. Raising people, expanding the territory, building structures to generate money or just to defend my growing borders has been an amazing experience; one that I did not expect from of browser-based social game. Funzio has crafted a great game that should pull some real gamers to the realm of social gaming and actually enjoy it. I suggest everyone give it a shot.